The Ranging Bloyster (ケメクジ?) is a boss in Pikmin 2 that resembles a large Toady Bloyster, and is likely named for its longer mouthparts or increased travel range. These creatures have an affinity for shiny objects and will track the active leader's light beacon, making them impossible to approach unnoticed from behind. This creature is found only on the last sublevel (7) of the Shower Room, sublevel 7 of the Hole of Heroes (along with two Cannon Beetle Larvae and two Decorated Cannon Beetles), and the last sublevel (2) of The Giant's Bath in Challenge Mode. There is a glitch that makes the Ranging Bloyster still "live" after the player kills it. If it's defeated while its antenna is still glowing, the tail left behind by the Bloyster might still glow and beep; however, it will only glow if it's taken to the ship. Particularly: Explain the mechanics when there are two players fighting it. Also, apparently it can be damaged by throwing Purple Pikmin at its hide, though this may be a Japanese release-only thing. This beast can be difficult to defeat in a timely manner, but with the right strategy, can be overcome without losing any Pikmin. The Bloyster will hunt your active leader and will change its target accordingly if you switch. However, there is a slight delay between the time it stops chasing one leader and starts on the other. Use this to your advantage by placing each leader on either side of the beast. Lure it towards one, then switch with / and quickly toss Pikmin onto its vulnerable tail. Call them back when the Bloyster turns to face you, then repeat. Another way to deal with this boss is to attack it with a single group of Pikmin led by both leaders. Because it pauses slightly in order to track the leading leader, the idea is to keep switching control of your leaders every time it turns your active leader's color. In this way, it is very easy to simply walk past it, step behind it, and throw Pikmin at the bulb on its tail without trouble. Be sure to call back any Pikmin that get shaken off their target. In the Hole of Heroes as well as The Giant's Bath, the arena for the fight is very big, and you can easily corner the Bloyster. Defeat the Armored Cannon Beetle Larvae and Decorated Cannon Beetles in the Hole of Heroes by having them shoot rocks at each other. The Ranging Bloyster cannot be harmed by the rocks. Then, have a leader lure the Bloyster to one of the corners of the room. The leader will be close enough to keep the Bloyster's attention, but the Bloyster cannot reach the leader, as its range does not reach the corners of the room. 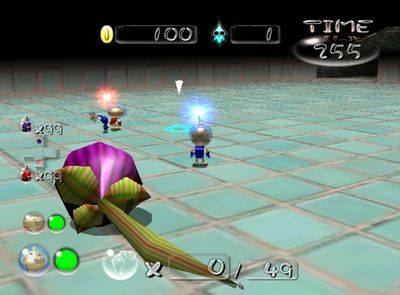 Have the other leader bring all the Pikmin to the other side, switching between the two leaders while approaching to keep the Bloyster's attention on the one out of reach. When close enough, throw Pikmin onto its tail, while switching to keep it from attacking the group of Pikmin. If a spray or purples are used, the Bloyster can be defeated within less than a minute without casualties. A much more time-consuming method is to have a 100 strong army, confront the Ranging Bloyster, spray it, and then toss Pikmin onto its back. When it unfreezes, simply spray it again, and any Pikmin that were thrown off will leap back on it to continue the assault. Note that this can take multiple ultra-bitter sprays and the Pikmin will likely revert back to leaf Pikmin when thrown off, but it is a far safer method. A safe but slightly slow way is to use a single Purple Pikmin. Begin by making the Bloyster use its main attack. While it's busy doing so, go around it and throw the Purple Pikmin at its bulb. Slowly rotate alongside the Bloyster so that it does a full circle. When it reaches its initial position, make it attack again, and while it's doing so, go to its back, whistle the Pikmin, and re-throw it. Repeat this until the creature is dead. As a last resort, White Pikmin can be fed to the Bloyster, each dealing heavy damage when eaten. At least 8 are necessary to poison the creature to death. Internally, Toady Bloysters are actually Ranging Bloysters, except with some properties that specify the differences, and the hard-coded ability to track leaders removed. The Ranging Bloyster is called such because it is like the Toady Bloyster, but has a proboscis that has far greater range. In Japan, the creature is called ケメクジ?, which has no known translation. 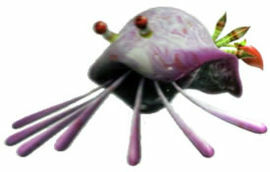 The boss's scientific name is Molluschid predatoria, where predatoria is similar to the English word "predator", given how this creature is much more effective at hunting down Pikmin compared to the Toady Bloyster. Internally, it is called umimushi, which is a Romanization of うみむし?, or "Sea Insect". French (NoE) Eventraille Adulte Portmanteau of "éventrer" (disembowel) or "entrailles" (innards) and "éventail" (fan), and "adulte" (adult). A Ranging Bloyster in the Piklopedia. The Ranging Boyster attacking with its seven tongues. A Ranging Bloyster targeting Captain Olimar. The Ranging Bloyster targeting Louie or The President. Two Ranging Bloysters attacking Louie in an unused cave (last_4). The creature's e-card, #25 (20th blue card). The Ranging Bloyster can be seen at the bottom of the image, below the Pikmin counter's slash. When the Ranging Bloyster dies, its body shrinks down, except for the bulb, which can then be carried. The body doesn't shrink down that much, and can actually be seen by zooming in the camera. This also happens with the Toady Bloyster, in both games. This page was last edited on February 16, 2019, at 16:33.